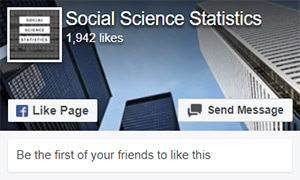 Social Science Statistics offers free resources for students and researchers working with statistics in the social sciences. It grew out of statistical tests that were devised to analyse the data generated at the Philosophy Experiments web site. The output of our calculators and tools has been audited for accuracy against the output produced by a number of established statistics packages, including SPSS and Minitab. However, we do need to include the standard disclaimer that we do not guarantee the accuracy of the results generated here. For further information, please see our legal disclaimer.